Returning for Season 3 in September in the UKand January 2013 on Masterpiece on PBS, the hit drama series Downton Abbey will see wrenching social changes, romantic intrigues, and personal crises that grip the majestic English country estate, now that the Great War is over and a long-awaited engagement is on. Written and created by Julian Fellowes, the show has become a worldwide cultural phenomenon, breaking records with all of its nominations for the Primetime Emmy Awards. While at the PBS portion of the TCA Summer Press Tour, Fellowes talked about how this season will be about the recovery from the war, the advantages of being able to create a story set in the past but with a modern mind-set in writing it, what actress Shirley MacLaine will add to this season, how amused he is by the people who wrongly point out inaccuracies in the show, and how far he’d like to take the story. Check out what he had to say after the jump. Question: Last season was considerably darker with the war, but now there is an impending marriage. Would you classify this season as a little brighter and more cheerful, or is it just as dark? JULIAN FELLOWES: We like a few laughs. This season is about the recovery from the war. The war brought a tremendous disruption to England and took many, many families, of all sorts. There were those few years when people were trying to decide if the world was going to go back and be the same as it was before, or had it changed completely, and that’s really the theme of the series. There are chills and spills involved in that, for all the characters, with some laughs and some tears. When people try to figure out what makes this show different from other Masterpiece programming, they say that it’s because it’s done in a classical setting, but you don’t have to base it on any novel. What are the advantages of being able to create a story and set it in the past, but use your own modern mind-set in writing it? FELLOWES: Well, I think there is a liberation in it being original because you can go into areas of the period that a contemporary novel would not have done. There are many subjects that we range, whether it’s women’s rights or homosexuality, or whatever, which you wouldn’t find in a novel written in 1906, or whenever. So, you do have that freedom. The discipline is to look at those subjects, within the context of that period. You must be careful to try to give people reasonable reactions and emotional responses that are right for their own time, and not simply someone who’s been parachuted in from 2012. I think that the decision to make it more like modern American television series, like The West Wing and E.R., with lots of plots going on – big plots, little plots, funny plots, sad plots – seems to be right for the energy of now. It seems to meet what the audience wants. With Downton, the fun is that it looks like a classical period drama from the ‘70s, but everyone is in bustles and ringing for lunch, and the energy is much more modern. I think that has worked for us. What does Shirley MacLaine add to Season 3? FELLOWES: One of the key elements that Shirley brings into the show is to remind us that Cora’s (Elizabeth McGovern) upbringing was not the same as Robert’s (Hugh Bonneville). During the first years of her marriage, that’s all been suppressed, to a certain extent, and she’s had to get on with it and do it the way they do it. But, as things start to change and the plates are shifting and we are reminded what Cora’s come from, Cora is less afraid of the future than Robert is. She’s much less afraid of change. Now, you’ll start to see more and more of that because she’s less afraid of expressing that. We have had moments of dissidence, in the first two seasons, when she refuses to think ill of Matthew (Dan Stevens) because he has a job. She doesn’t like him taking her money, but she’s not prepared to criticize him for having a job. 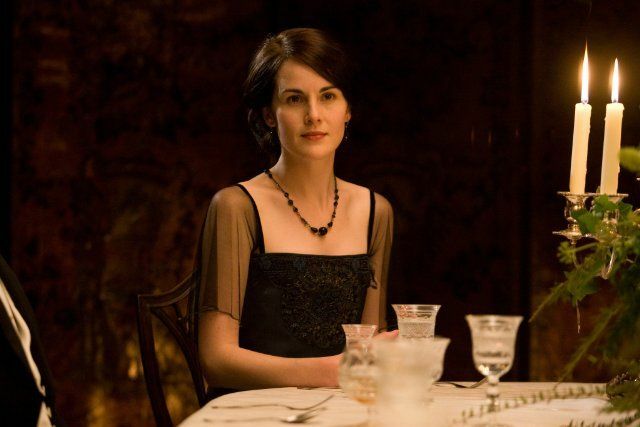 And she’s dismissed when Mary (Michelle Dockery) says, “You’re American, mother. You don’t understand these things.” That’s all changing now because, if anyone understands the world that’s coming, it’s Cora. The bringing in of Martha (MacLaine) ushers in that new era, by reminding us that Cora comes from a different past. As Downton Abbey exploded onto the scene, here in the States, someone decided to pick out all the anachronisms in the script and the expressions that were not used back then. Is that something that you pay any attention to, at all? FELLOWES: The interesting thing about this is that, when these people complain, the newspapers always assume that the complainant is correct and the show is wrong. In fact, in more or less every single case, the complainant was incorrect. There was a song that someone said hadn’t been released when they sang it. Yes, it had. There was the thing that nobody had said “boyfriend” before 1930, but it was first in print in 1879. I was reading a Trollope novel once, and someone said something to the heroine and she said, “Oh, tell that to the Marines.” I thought, “Well, that must be completely out of period. That’s a Second World War phrase.” But in fact, the book was published in 1867. Colloquial language is much older than a lot of people think. I’m not saying that we’ve never made a mistake. I’m sure we have. But with the language, I haven’t yet found one where the complaint proved to be correct. The latest one was “kids.” Someone said, “Oh, I’m sure ‘kids’ was a post-Second World War description of children.” But in fact, it was first used in the 15th Century. I think the constant surprising of the audience by realizing that these people are much more like us and much more normal, and that there isn’t a place called Period where these strange people live in funny clothes, is one of the strengths of the show, really. Did they make a class system out of the necessities of the wardrobe, since it was virtually impossible to get dressed by yourself, or was it the other way around? FELLOWES: I think it is true that, as life changed, part of that was the endless disciplines and the fact that you couldn’t get either dressed or undressed without someone else’s help, or you had to be in the dining room at this point and out of it by this point. In the end, it just became an enormous bore, for everyone concerned. In the ‘50s, there was an attempt by Dior to bring back the crinoline and all these corsets, and it looked absolutely ravishing, but it didn’t last because it didn’t match the life everyone was leading. Things go faster. We don’t want to be dependent, in that same way, for our ordinary life. We like to be able to just get on with it. It’s not even a money thing. People think, “Oh, it all ended because people couldn’t afford it anymore.” And I’d say that was part of it, but the main reason was that it just wasn’t right for the way people were thinking, after the first war, and even less after the second. There was a wonderful divorce case, in this period, of somebody called Lady Colin Campbell. It was remembered chiefly for the fact that, among the people that she was accused of sleeping with were the Duke of Marlborough, a famous surgeon, and the chief of London’s fire brigade. But, one of the reasons they found against her was because, when her maid came to undress her that night, her clothes had all been misfastened. The conclusion of the judge was that she had been dressed by a man. In Season 3, with all the changes post-war and now that they’ve lost the money, are we going to see changes in aristocratic life? FELLOWES: Yes. These were tough years for those families and households, and many, many great families would go to the wall between the wars because the ways of keeping these estates got easier. It didn’t get more difficult. It got easier because successive governments decided that it wasn’t such a great idea to smash up all the agriculture estates, so they would no longer charge death duties and you could set up individual trusts that made things easier. But for that initial generation, when the taxes were going up, and death duties were levied between husbands and wives, it was none of that modern thing of where one-half of the couple gets nothing. It was a toss-up, in many families, as to whether or not it was worth the struggle to go on, and that is a dilemma that is faced by the Crawleys. You have to watch the series to find that out. In a lot of ways, Lady Mary (Michelle Dockery) has actually been at the center of the drama on the show. What’s going to happen with her, in the future? FELLOWES: The risk of scandal makes her vulnerable. She was invulnerable before that. I think Mary is one of those people who does not want to give in to society. She’s a very strong personality, but she’s not a rebel. She doesn’t want to live outside society. She wants to negotiate the rules, so that she can stay inside. Mary thought she would get away with the Pamuk incident, but it haunts her. It has given her an Achilles heel, and people know about it. To a certain extent, maybe she’ll get past it, but she can never feel the superiority of being perfect again. How did you come up with the limp for Mr. Bates (Brendan Coyle)? FELLOWES: That was my wife, Emma. Normally, no valet would be able to limp because part of their job was carrying suitcases and waiting tables. It seemed such a simple change to make, but it worked. When he arrived, all of the other servants were nice and said hello, but you could see them all thinking, “This guy limps!” It worked really well. I’ve always been very thrilled with the thing. Ideally, how far would you like to take this story? Do you have a year in mind? FELLOWES: I don’t think we’ve really thought in that way, actually. Each series takes about two years, and I think we will just continue to move forward, at that pace. The great thing is that you don’t have to have anybody doing wobbly stick acting with gray wigs. They can remain reasonably the same age. The ‘20s are a very interesting period to me. Once you get into the ‘30s, then it’s the Nazi-dominated, “Europe prepares for the war,” period that we’ve all seen exploited in different films. The ‘20s are a much more nebulous time. Here, you’ve got Prohibition and gangland in Chicago, but we haven’t even really got that. We’ve just got a transition between the Old World and the ‘30s and the Second World War happening. I think it’s rather fun to be journeying through that bit in the middle. In the third [season], you see the impact of the Irish troubles on this family. That really started up after the end of the First World War, and was much more the headline than the suffragettes, or the other things. The Irish problem seemed to be a yawning difficulty for the British empire, and I don’t think a lot of people know about that. It would be rather nice to go into that. We always try, in Downton, to make references to things like the Marconi scandal, and a few people will talk about it, but we never really explain it. What we hope, in our rather simple way, is that people then go off to the internet and do a search to get the whole thing, and they realize it was in that year and it did happen and everything we were saying about it was valid and true. Obviously, most people who watch the show don’t bother to do that, but there is this vague sprinkling of events and references that, if you check them out, will work and are true. It seems to me to be rather good fun to be doing that in a much lesser-known period. So for all those reasons, I think we will be moving pretty slowly through the 1920s. We could go to the Wall Street crash, and then end with Robert playing a ukulele. That would be our big finish.